Kingsley’s career programme reflects the aims and aspirations of our girls. 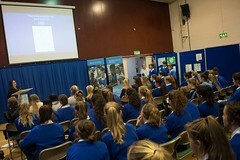 With a programme of activities throughout Senior School and Sixth Form, we support the girls to explore career areas they may be aware of, but also to broaden their experiences to motivate them to consider a range of possibilities; more importantly however, we want to support them in developing the skills needed to succeed in today’s rapidly evolving workplace – adaptability, resilience and a good understanding of their own skills and attributes to make effective career decisions throughout their lives. Assess their personal skills, talents, interests and aspirations. Aim high in their education and career choices. Develop their decision making skills. Increase their awareness of educational training and careers opportunities. Make a successful transition from school to higher education and ultimately into work. Modern careers guidance is as much about inspiration and aspiration as it is about advice, and many are responsible for guiding our girls on their career journey; school, careers professionals, family, friends and employers. We have built up excellent partnerships with local businesses and professionals who offer work experience placements, practice interviews and support our guest speaker programme. 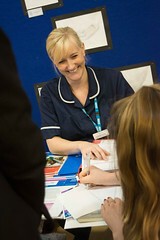 There is a dedicated careers office in the Sixth Form Centre, where our Careers Coordinator Sarah Bennett is based. Mrs Bennett has a wide variety of reference materials to aid research and decision making. Resources are also available in the Library (LRC). A programme of outside speakers from a variety of backgrounds to inspire and enthuse the girls and provide genuine ‘moments of inspiration’. 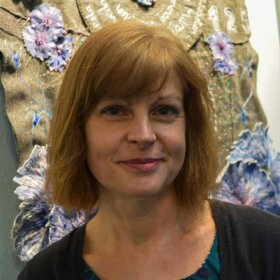 All year groups receive careers education as part of PSHE, and ongoing impartial advice and guidance is available from Mrs Bennett who runs a drop-in in the LRC each Thursday where support is available with interactive online careers tools. A termly newsletter to inform, inspire and signpost current opportunities. 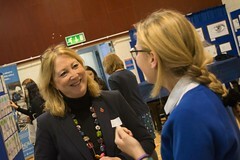 Year 7s enjoy a fun, fast-paced ‘Guess My Job’ careers investigation day. Year 8s can take part in the National ‘Take your Daughter to Work Day’. Year 9s participate in an Enterprise Challenge to develop key employability skills in a fun, interactive session. Year 10s can choose to undertake psychometric profiling to assist them in their careers choices ahead. Year 11s receive ongoing impartial advice and guidance. 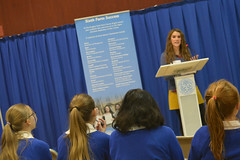 Additional workshops in school led by local experts, e.g. 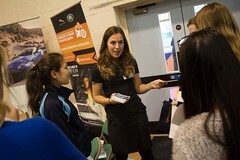 ‘Building Your Future’ exploring professional opportunities in the construction industry. Support securing work experience placements in years 10 and 12, increasingly vital these days. In Sixth form, access to and support with the UCAS website and higher education applications. Mock interviews for year 13 students in preparation for university entrance. A full enrichment programme in sixth form offering guidance on a variety of topics, such as CV writing, interview tips, your digital brand, employability skills. Workshops outside of school hours for parents and girls to learn more about specific topics, e.g. the future workplace, degree apprenticeships. 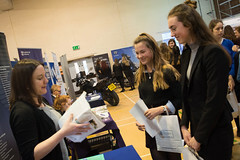 A bi-annual careers event, aimed at years 9-13 to meet and talk to representatives from a wide variety of businesses and different career sectors. 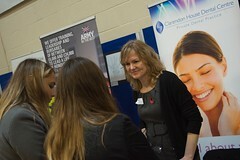 Individual and personalised support, advice and guidance, in-house and with external careers experts. "The provision of careers advice is valued by the pupils, who speak highly of the advice they are given as they progress through the school." Girls are encouraged in Years 10 and 12 to undertake work experience, which provides an invaluable opportunity for them to develop their insight into the world of work, and the skills, responsibilities and attitudes that are required in today’s workplace. It provides a chance for them to learn about different industries/sectors, helps them to relate their studies to the world of employment, and assists them in making a more informed decision about their future careers and life beyond school. 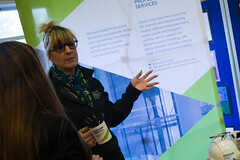 Links with employers, our alumnae and up to date LMI knowledge (labour market information) means we understand the current marketplace and know what employers are looking for. In the Sixth Form, students are required to make important decisions regarding higher education and their future careers and personalised guidance is always available on the many opportunities ahead to them. In year 12, students attend a higher education convention and take part in a ‘Next Steps’ workshop exploring different pathways ahead. Students are permitted to attend university open days during term, but are encouraged to do so in their own time so as not to disrupt their studies. During year 13, professional support and guidance on UCAS applications means that nearly all students receive offers from their first choice institution. A full enrichment programme ensures guidance on a variety of topics, such as CV writing, interview tips, your digital brand, employability skills, student finance, and university survival skills. Mock interviews are held during the autumn term for year 13s with the participation of outside specialists. The vast majority of students leaving us progress to higher education, with others securing competitive higher level apprenticeship placements. 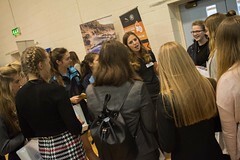 Recent leaver destinations include Surrey, Loughborough and Exeter, with girls moving on to study an impressive array of subjects such as Law, Business Management, and Communication and Media Studies. Whatever they choose, we support them in fulfilling their potential and equip them with great career management skills to help them achieve their aims. The Getting into Uni Guide – from respected source Which? Informed Choices – A Russell Group guide to making decisions about post-16 education. 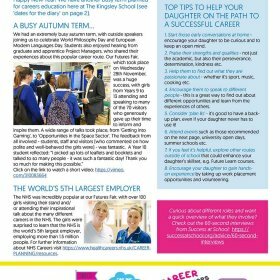 The Employability Question – A Parent’s Guide to Careers – A useful resource from our colleagues at Inspiring Futures. Your Daughter’s Future – A Toolkit for Parents – A Guide for parents covering various topics and guidance for different age groups. The Student Career Guide – The Path to your Perfect Career – An online booklet covering work experience, sector profiles and graduate schemes. This is aimed more at Sixth Formers. Careers of the Future – a guide on career choices, assisting young people to help make decisions for the future. The Times Top 100 Graduate Employers – a list published in The Times. A Handy Guide to Apprenticeships – a guide to apprenticeships from ratemyapprenticeship.co.uk. What do Graduates do? – insights and analysis from the UK’s largest higher education survey. Paths to Professional Careers – a Parent’s Guide – a guide to careers from TARGETcareers. How2Become – a useful website with guides to look at online or purchase, plus advice about selection processes. View our latest Careers Newsletter here.